No real blog tonight, as I’m doing the election-watching thing, but if you backed Reaper’s Bones Kickstarter and you only glanced at today’s email update, you may not have noticed that your free PDFs are now available for download on the Pledge Manager page. Personally don’t care much about the novel, but I am definitely interested in seeing how Swords & Wizardry Complete implements its particular flavor of OSR, having already read the publicly free Swords & Wizardry Core. The D&D campaign setting nostalgia will return next week; tonight I’m posting my first review for a contemporary RPG product. 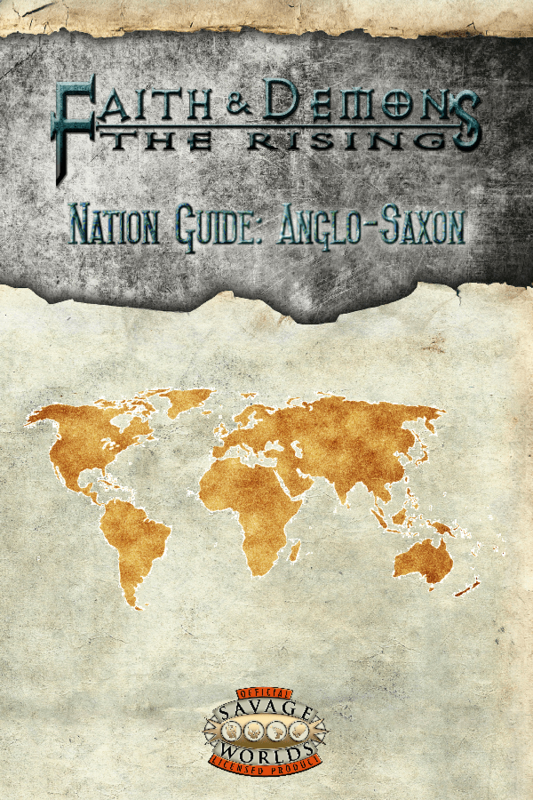 Faith & Demons Nation Guide: Anglo-Saxon ($1.95) is a 28-page PDF for use with Savage Worlds published by Mystical Throne Entertainment. I happened upon it by chance, and even though I don’t own Faith & Demons: The Rising (the setting that Anglo-Saxon is intended to supplement), I figured at the price point it was worth a shot. In many ways, Anglo-Saxon reminded me of a more condensed version of the old AD&D Historical Reference series. The first 7 pages provide a quick overview of 7th Century culture in Britain, with a color coded map showing how the island was divided amongst the various Germanic tribes. There’s basic info on Anglo-Saxon paganism and folklore, as well as a brief bit on the spread of Christianity. That’s followed by an 8-page gazetteer of British kingdoms along with some notes on military structure and currency, such as it was. Then we have a few pages on fantastic hooks to be found in historic events along with a timeline. There are a few Hindrances and Edges presented beginning on page 21, some of which relate back to the Faith & Demons setting, but most of which could be used in a historic campaign without needing the setting guide. Five monsters from Anglo-Saxon lore are presented in the Bestiary, and if you’ve got a loving history with D&D but have moved to mostly running Savage Worlds (as I have), these monsters alone justify the $2 price tag. Dwerger, dwerrow, eoton – do those names sound vaguely familiar? The creatures as presented here are intended to hew a bit closer to their mythological basis, but given the relatively simplicity of Savage Worlds monster entries, there’s a lot of room to play with. For example, the Eoton is a mountain-dwelling, cannibalistic giant rather than the two-headed Ettin of D&D, and is probably my favorite entry here due to their devastating tendency to stomp their smaller foes. I would have liked 2-3 more pages of mechanical content, but I was generally satisfied with the purchase. Though much of the historic information could likely be easily found on the internet, it is always nice to have a handy reference document that hits the high points and is written with gaming in mind. If you are running a loosely historical Anglo-Saxon game or just want a little extra inspiration for a traditional western fantasy game, the first Faith & Demons Nation Guide is a solid investment. I’m excited to take part in the latest round of play testing for Kingdom, the new game from Ben Robbins, creator of Microscope and the famed West Marches campaign. The eponymous kingdom can actually be any sort of institution to which the player characters are intertwined with, be it a frontier town, a modern hospital, or an interstellar empire. Gameplay determines the fate of the kingdom as influenced by the PCs. During my initial read through of the rules, I kept thinking that a game of Kingdom set around a traditional western fantasy nation would capture the feeling of Game of Thrones better than any other game I’ve ever come across. I’m really looking forward to giving it a spin as soon as possible.